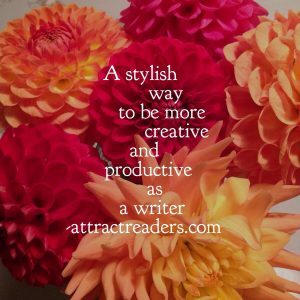 Have you ever wondered whether there is an easy and enjoyable way to be more creative and productive as a blog writer? The answer may be easy for anyone who likes writing a daily journal or who has a passion for handwriting and good stationary. Coincidentally I'd just returned from my favourite stationary shop feeling rather pleased with my two new Moleskine notebooks. One is to help me capture new ideas and the other is for my ‘to do’ lists. Personally, I love nothing more than looking for nice stationary. The idea of filling a brand-new notebook never fails to inspire me. You see, I’ve always been a paper and pen person at heart and I do like good design. Now that doesn’t mean that I have never used online project management tools or Apps! Indeed I love using smartphone Apps like Wunderlist and Pocket. They help me to plan bigger projects and sort online information - especially all those interesting blog posts I save up to read on a rainy day. Apps are most useful and can help you to save time as well as be more productive. But sadly they can't usually help you to be more creative. And I believe every blog writer needs something to help them feel inspired! Indeed, three years ago I even switched back to a paper diary after years of using a smartphone and Outlook for my meetings. Whilst everything may take you a little longer, I find that writing in a notebook can actually make you feel more mindful and in the moment. 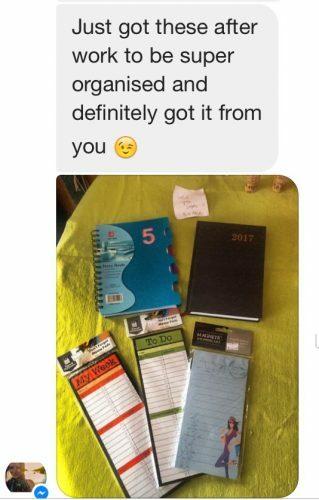 So there is something truly magical about using stationary. I still treasure the notebook my Attract Readers colleague Jean gave me when we designed our first e-course. Two years ago already…how time flies! I now collect notebooks and use different ones for different tasks. One for my client meetings, one for capturing blog ideas and one for general business stuff and task lists. 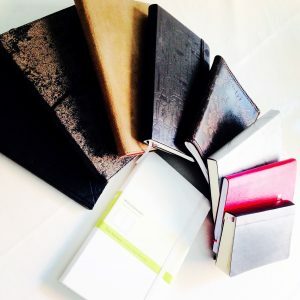 Some notebooks always stay on my desk and others travel everywhere in my handbag or workbag. When I’ve filled a notebook I like nothing more than flicking through to see all the things I’ve crossed out. As I tend to keep my notebooks I can easily see how productive I’ve been and how much I have achieved over a specific period of time! On some pages I’ve just scribbled, doodled or written down random thoughts. On others I’ve drawn Mind Maps with coloured pencils or listed things neatly with a fountain pen. I can always tell by my doodles and my style of handwriting, whether I felt rushed, bored or inspired at the time. Whether I was creative and productive or completely unfocused. For me, making lists and breaking projects into smaller tasks is one of the most tedious and boring office tasks of all. And a business blogger seems to have many of those! 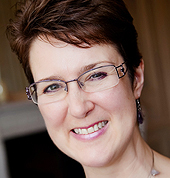 From post planning to researching topics, keywords and creating compelling headlines. 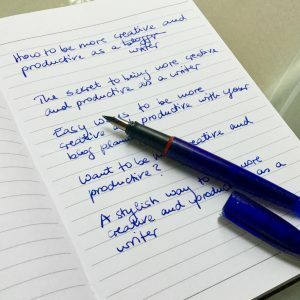 And what about all those blog promotion tasks?! In my experience, not capturing tasks and ideas every day or at least every week, is risky. It’s all too easy to feel overwhelmed and no doubt forget things too. 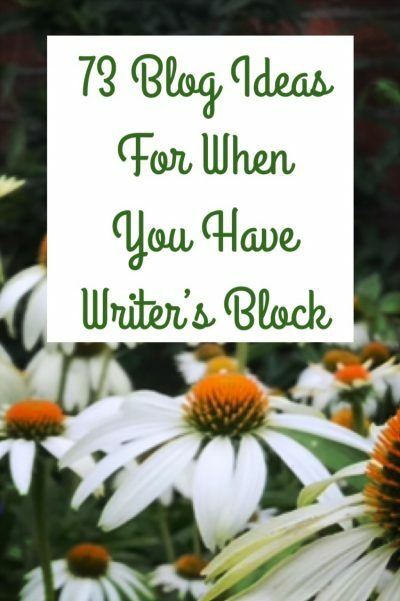 Especially when, like me, you can only work on blog posts in small chunks of time! So my way to be more productive and make planning more interesting is to use a well designed notebook made of high-quality paper. I don’t mind if they cost more – for me the extra is worth it. The same goes for my fountain pens: a little old fashioned they may well be, but they are much nicer to write with than any pen I know! For a start, the result is a softer and perhaps more pleasing writing style. It may seem a little odd, but I don't mind looking at a potentially boring to-do list that is nicely written, in a nice notebook. It's my way of turning a tedious routine task into something that I actually find enjoyable. Handwriting can also make you feel more creative. Seeing thoughts and ideas take shape in this way can feel quite satisfying. If you keep a handwritten journal then you'll know how it feels. So... have I inspired you to be more creative and productive? And perhaps even to go out and buy a nice new notebook? Or is there anything that works for you that you are willing to share with us? 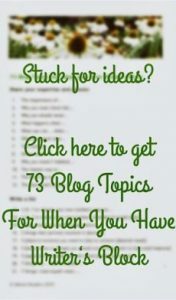 Categories for your blog post – who needs ’em?